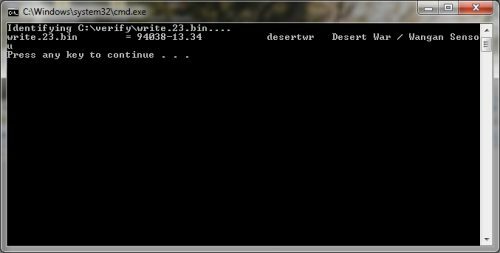 Obviously replace “myromfile.bin” with the name of the file you created. This will then search through the MAME ROMs for a match. If an approprate match is found you can be assured that your EPROM is good, however if no match is found that means either one of two things: Either your ROM is corrupt, or you found a ROM that hasn’t yet been dumped and added to MAME. Are there really that many games that haven’t been dumped for MAME? The latter isn’t as uncommon as you might think. I’ve actually been able to contribute a few new ROMs to MAME simply because I happened to have an different revision of the game than what had been dumped before. Even back in the 80s and 90s bugs that were found were patched and new ROMs were often sent out to arcade operators to update their machines. Somtimes you find PCBs with older revisions that haven’t been dumped yet because someone never got around to updating that board. These older revisions can often be vauable in better understanding the hardware. Similarly you may find a late bug fix version that was never previously dumped because by the time the update came out the games weren’t in use anymore. These versions can often be valuable too as late version often have the most stable gameplay and sometimes new features or options. Depending on where your located a difference in ROMs may also be due to regional differences, may games got slightly different code and assets depending on which country they were sold in. So if you imported a PCB from another country or if you live in a country where not many people have contributed to MAME it’s possible you have a unique version that hasn’t been added to MAME yet. Most game manufacturers will put a serial number or revision code on the ROM label [see above photo], these are often reflected in the ROM names in MAME (on the actual ROM files inside the ZIP, or in the MAME source code) so a good (but not foolproof) way to determine if your mismatched ROM is to check the label and see if the one in MAME matches. If you think you have an version of a game not in MAME then contact a member of the Dumping Union. 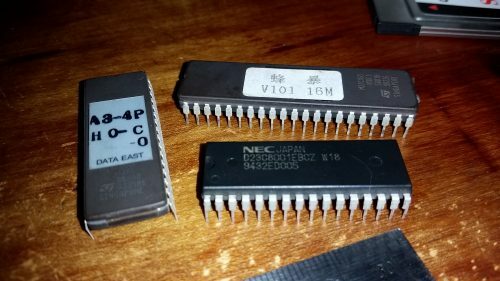 I highly recommend NEVER over-writing an original EPROM, these chips are relatively inexpensive and weither you’re trying to fix a corrupt ROM or if you’re trying to convert to a different revision, region, or game. the safest bet is to leave the original chips be and store them someplace safe, while replacing them with different, newly written chips. An Easier way to check your ROMs. Hopefully I’ve convinced you of the value of dumping your ROMs and comparing them to MAME, but writing out that command line for every ROM is a chore. There’s a great website that can check your ROMs online: Hamster’s Online ROM Identifier. But, if you’re like me you probably don’t want to be uploading all your ROMs to some website and would rather check them on your own PC. To that end I’ve written a small batch file that you can place in your MAME folder, and then simply drag and drop your ROM file onto it. This makes it quick and easy to check your files within a windows environment, particularly if you need to check a lot of files.